medical Plant from tropical Africa is such an open place exposed to direct sunlight. In Indonesia planted as a hedge plant, potted plants, or grow wild and can be found from the lowlands to 600 m above sea level. Shrub, growing upright, 2-6 m, base woody, much branched, a poisonous milk sap. 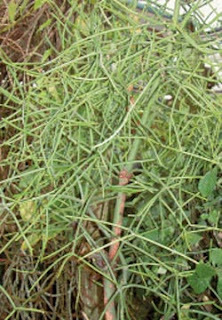 Stalk after growing about 1 inch will be located in two branches, and so on so that it looks like the branches were broken. Fracture has a cylinder-shaped twig pencils, fine ribbed longitudinally, the color green. medical plant patah tulang have The leaves are rare, found on the tip of the young twig, a small, rectangular shape, 7-25 mm, falling fast. Flowers are the tip of the stem, composed of compound interest such as bowls, greenish yellow color. The fruit when ripe will burst and throw the seeds. PART USED: Root, stem wood, twigs, sap. - Rheumatism / bone pain. - Ulcers of the nasal cavity. - Skin diseases, Leprosy (Hansen Morbus). - The foot and hand numbness. - Itchy disease, scabies, boils. - Mole enlarged and itching. - Herpes zooster, chronic skin diseases. thickening of the skin (clavus), warts. - Broken bones (fractures). Pricked with thorns, broken glass, fish bones, etc..